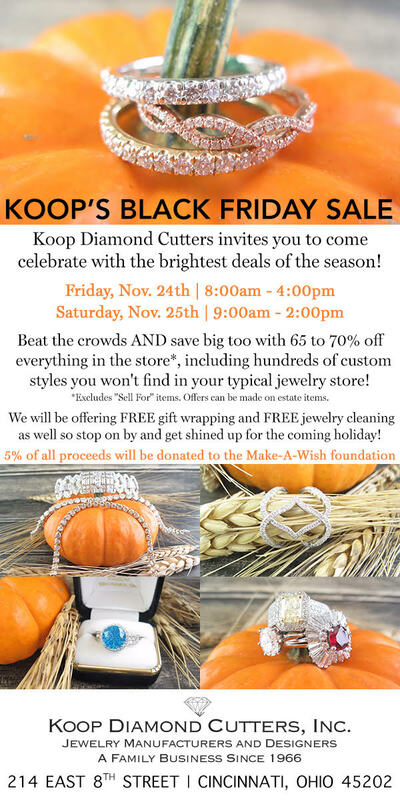 My friends at Koop Diamond Cutters are having a HUGE Black Friday sale on November 24 and 25! You’ll be able to snag some fab jewelry at a great price and even help a good cause in the process! You’ll not only beat the crowds, but you’ll save 65 to 70% off everything in the store, with some exceptions, including hundreds of custom styles you won’t find in your typical jewelry store! You can also enjoy free gift wrapping and free jewelry cleaning, so stop by and get your diamonds shined up for the holidays! Plus, 5% of all proceeds from the Black Friday sale will be donated to the Make-A-Wish Foundation! Koop is open on Friday from 8am to 4pm and Saturday from 9am to 2 pm. The store is located at 214 East 8th Street in Cincinnati! Learn more at http://koopdiamondcutters.com. Previous Post“Thanks for the Memories” Sale at Pizazz!Next PostChild Auditions for WAITRESS Musical!